Why is the screen black after my Windows VM boots? This KB article applies to Windows Vista and Windows Server 2008 and later. Sometimes you boot up a VM in Skytap and, after the VMware logo and the Windows logo display, the screen goes black. This article helps you replace an incorrect display driver with the VMware 3D SVGA driver, which corrects most display problems. Without starting the VM, click the VM thumbnail to open the Secure Remote Access (SRA) browser client. In the browser client toolbar, click to turn on the virtual keyboard, and then click to start the VM. At the VMware splash screen, repeatedly press F8 on the virtual keyboard until the Advanced Boot Options screen displays. 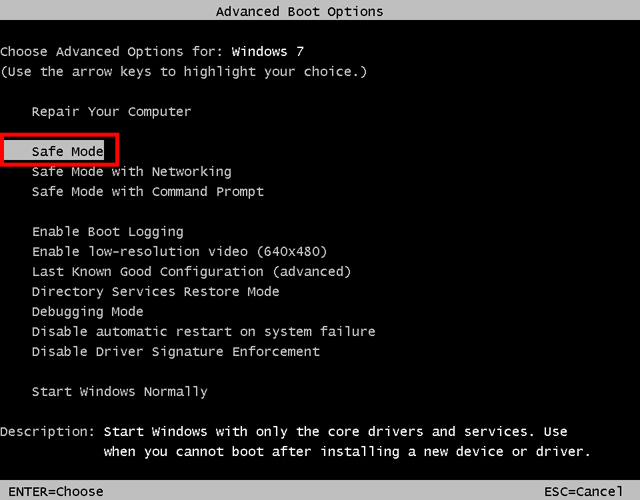 Use the arrow keys to select Safe Mode, and then press Enter to restart the VM in safe mode. Note that mouse movement in Safe Mode may be erratic. Sign in to the VM. From the Windows Control Panel, open the Device Manager. Under Display Adapters, uninstall the VMware display driver. Restart the VM. After the VM restarts, Windows should automatically update the drivers.